When the two month break from the ASP World Tour rolls around, it’s the perfect opportunity for competitors to return home and work on new maneuvers. It’s also the perfect opportunity for surfing fans to cram for their university exams without major distractions (such as the live online broadcasts). Over the break, our fearless champions have been surfing, partying, travelling, relaxing and preparing themselves for the remainder of the 2011 season. Now it’s time to bring you up to speed. Hot off the press is Patrick Gudauskus, claiming his first ASP Prime victory at the Mr. Price Pro Ballito, South Africa. The 25-year-old San Clemente surfer was triumphant over up and rising young gun Hawaiian John John Florence (yes, its John John! ),18, in perfect barreling conditions. 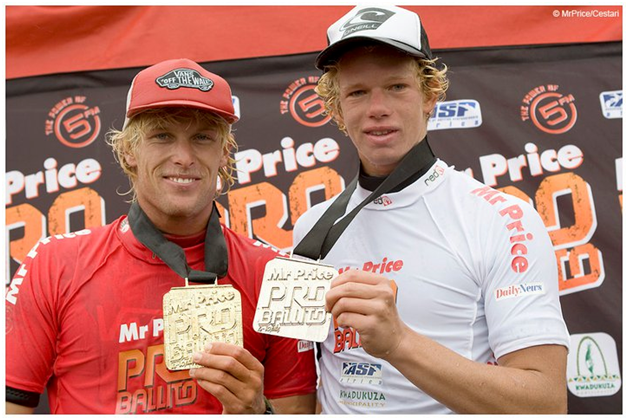 P-Gudang has kept the Mr. Price Pro trophy in the family, backing up younger brother Tanner’s victory from 2009. The two brothers are the second pair of siblings to claim victory at the event, following in the Iron’s brothers footsteps, those of Bruce and the late Andy. Now Patrick’s twin Dane just needs to win the Mr. Price Pro, and there’s new history in the making. The win catapults Gudauskus from 27th to 15th on the current leader board, placing him in a positive position before the mid year cut off. Our female surfers have packed their bags and are arriving in France as we speak for the Roxy Pro. The event is scheduled to kick off on the 11th -17th July. Currently, Carissa Moore (HAW) and Sally Fitzgibbons (AUS) are locked in a two-horse battle for the title of World Champion. Out of the 5 events that have so far occurred, Moore has claimed victory at three, Fitzgibbons has claimed two. Fitzgibbons also adds another win from the Women’s Star events. Mick Fanning, two times World Champion, is currently sitting in 8th spot. Far from where he wants to be, and not where he should be. During his break, he has been a busy beaver. He was spotted by local Rainbow Bay Surf Lifesaver Cassidy Jackson-Carroll at D-Bah, pulling into some impressive waves. ASL magazine ventured with him to South Stradbroke Island where he was tucking into gorgeous barrels, and our White Lightening has even been to Mexico and Fiji. Fanning has been working closely with Coach Phil McNamara, in order to secure better results for the remainder of the season. With two equal 13ths and a 2nd, the Coolangatta kid can’t afford anymore poor results. Dane Reynolds (USA) has re-signed with Quiksilver for another six years. As one of the most progressive surfers in the world, Reynolds has missed the first three events with injury, but is looking to come back at the Billabong Pro Jefferies Bay later this month. In an interview with ASP, Reynolds says “’I’m really happy with the people I’m working with (Quiksilver) and I’m really pleased that they offered to re-sign me. I think we’re in a position to make some rad stuff and have a ton of fun while doing it”. Dane Reynolds is pretty rad, and it will be great to have him back on tour. Jordy Smith, 23, (ZAF) has been puckering up with new girlfriend Llyndal Jarvis, along with working on impressive maneuvers, and competing at the Mr. Price Pro, Ballito, unfortunately, to be knocked out by Gudauskus in the semi finals. Smith has come a long way from sleeping in board bags under event towers (courtesy of STAB mag), and is currently ranked 5th on the World Tour Leader board. He has been captured flying high with flares attached to the tail of his board. Pretty impressive images courtesy of STAB magazine and Bill Morris. Shane Dorian and Billabong have working together and created a wetsuit perfect for big wave surfers. Together, they have released a Billabong wetsuit with an inflatable air pocket, which can be inflated with a tug of a cord when surfers are deep under water. After a near death experience, Dorian has tested the wetsuit in huge conditions, and believes that it will be beneficial for big wave surfing. The Billabong V1 (V for vertical ascent, and 1 foot above sea level) was given a public look earlier this year, where Dorian and a number of big wave surfers ventured to the notorious Jaws. Dorian came unglued in a tube, and was sent deep under water. Activating the Billabong V1, Dorian was quickly sent to the surface, and back into the lineup. Currently, the wetsuit isn’t available to the wider community, and patient representation is pending. On a recent trip to the Maldives, current ASP World Tour leader Adriano De Souza (BRA) suffered a knee injury that quickly sent him home for medical advice. Medical professionals have said he suffered hyperextension of the right knee, and is in an intensive recovery program. With his usual high spirits and friendly nature, De Souza says he will be at J-Bay. During our down time, the ASP has announced another two events for this year. Sri Lanka will play host to the Sri Lankan Airlines Pro, from August 30th – September 4th. The event will feature an ASP 6 Star women’s competition, and an ASP World Men’s Longboard competition. The event is set to be held at Arugam Bay. The second event is the Brazil Open of Surfing, for the first ever Junior World Champs. The 6 Star event, to be held at Arpoador Beach, the birth place of Brazilian surfing, and home to the Billabong Rio Pro, is set to allow 144 competitors, with a prize pool of US $145,000, and US $20,000 for the winner. The Brazil Open of Surfing will be stop number two of three on the Junior World Champs campaign, and will be held from October 18th – 23rd. Whilst it’s cold and miserable in the lower parts of Australia, the idea of the Bikini’s 65th birthday may cheer some readers up. The two piece garment, more commonly worn by females, celebrated its milestone birthday on the 5th July. French car engineer Louis Beard first unveiled the eye opener in 1946 and in 2005, $1.4 million dollars worth of bikinis were sold in America alone. If that doesn’t warm the heart, just imagine the world’s hottest female surfer Alana Blanchard surfing in her two piece outfit. In less than a week, the Men’s tour will reconvene at the infamous Billabong Pro Jefferies Bay, South Africa (more commonly known as J-Bay). Stop number 4 of 11 on the WTC hosts a perfect point break, the home to Jordy Smith, and dishes up some of the best waves for the whole tour. Last year, Jordy Smith claimed his maiden victory on home soil, and will be looking to do it again. The return of Dane Reynolds will add stiff competition, along with the freakishly amazing Kelly Slater, Joel Parkinson, Mick Fanning, and the ever so hungry-for-the-crown Taj Burrow. If Alana Blanchard doesn’t get your blood pumping, and you’re still shaking in this crazy weather, and you don’t mind a corny surf flick, grab a copy of the new release Blue Crush 2. Universal Pictures has just released the surfing sequel, where a young surfer girl sets off to Jefferies Bay in search of fulfilling her mother’s dream. There are chic’s in bikinis, blokes who can rip, and sections that make you laugh. Making guest appearances are Australia’s Laura Enever, Sally Fitzgibbons and Taj Burrow. Jordy Smith also makes a quick appearance, along with his Red Bull cap. Watch it just in time before the real J-Bay gets underway. If corny surf flicks aren’t for you, First Love, from Rip Curl and VAS comes highly recommended. Dubbed ‘The Real Blue Crush’ featuring some of Australia’s best female junior surfers, Jess Liang, Nikki Van Dijk and India Payne, as tell their story from Phillip Island, and their venture to Hawaii. These chic’s rip, and their inspirations Steph Gilmore, Coco Ho and Alana Blanchard also make appearances in the film. Don’t rip it off, grab a legal copy.